With Owen Wilson serving as grand marshal for the 59th DAYTONA 500 today (view photos below) and the NASCAR voice cast announcement last week, Disney•Pixar has released the brand-new Cars 3 Next Generation extended look that you can watch below! Directed by Brian Fee (storyboard artist for Cars and Cars 2), Disney•Pixar‘s Cars 3 begins when, blindsided by a new generation of blazing-fast racers, the legendary Lightning McQueen (Owen Wilson) is suddenly pushed out of the sport he loves. To get back in the game, he will need the help of an eager young race technician, Cruz Ramirez, with her own plan to win, plus inspiration from the late Fabulous Hudson Hornet and a few unexpected turns. Proving that #95 isn’t through yet will test the heart of a champion on Piston Cup Racing’s biggest stage! Cars 3 features the return of Larry the Cable Guy as Mater, Bonnie Hunt as Sally Carrera, and Cheech Marin as Ramone. There’s also some brand new characters, including Jackson Storm (voiced by Armie Hammer) and Cruz Ramirez (voiced by Cristela Alonzo). They are joined by NASCAR’s Jeff Gordon, Richard Petty, Chase Elliott, Ryan Blaney, Daniel Suárez and Bubba Wallace. Cars 3 is produced by Kevin Reher (A Bug’s Life, La Luna short). 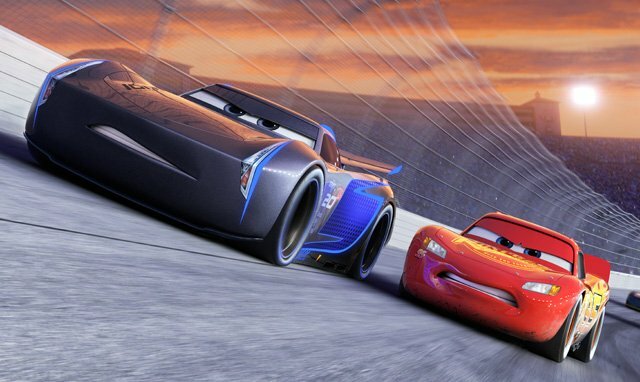 The first film in the animated franchise, 2006’s Cars, directed by John Lasseter, earned $461.9 million worldwide in 2006, and Cars 2 topped that with $559.8 million globally in 2011. Following the first two films, Disney Toon Studios released to additional films, Planes and Planes: Fire and Rescue, both set in the Cars universe. Cars 3 opens in theaters on Friday, June 16. What do you think of the new Cars 3 trailer? Let us know your thoughts in the comments below!